vCloud director 5.5: Catalogs problem #3 – Assigning catalog media files to different VDC within an ORG? We have a public catalog which is shared to all ORGs within vCloud. This also contains some ISO media files for users to mount to cdrom of virtual machines. However in order for a user to make use of a media file from a public catalog, that media file firstly needs to be copy to the local catalog of that ORG. Within this ORG we have multiple vDCs. This is where things get interesting. 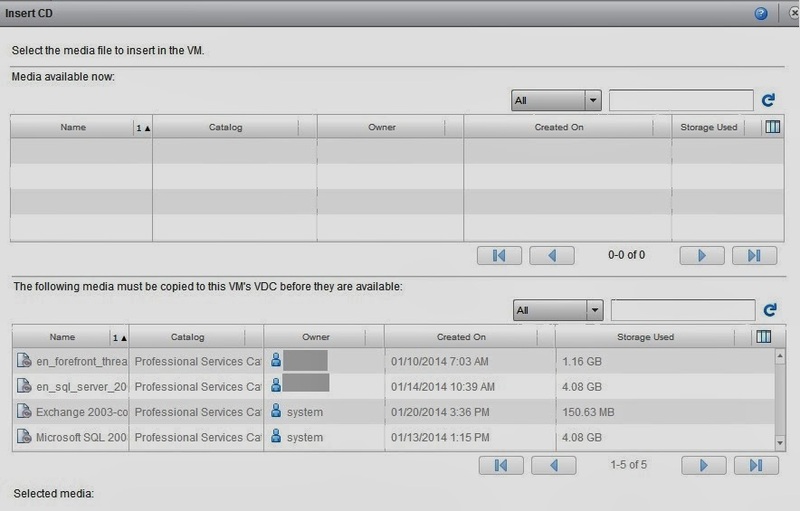 When a vAPP is deployed from catalog you assign this vAPP to a specific vDC. I believe the problem lies with how the Catalogs are done in 5.5. When creating or copying files into a Catalog, there is no method to accurately control where the item will be stored. This is more critical when there are multiple Org vDCs, and a file could be placed in an Org vDC to which the file is not intended for. This is a departure from vCloud Director 5.1, where importing media allowed you to select a specific Organization vDC. Even when you could select a vDC, you still needed to have the ISO image in the vDC where the VM resides to be allowed to insert it. I had a lot remote sessions and discussions with support on this issue since we could not find a way to assign a media file to specific VDC. Option 1 – Temporarily disable storage profiles before doing an ISO import. This would eliminate certain vDCs as an option, and force the selection process to go to the remaining vDC. this would be my recommendation. Option 2 – Set the catalog to use a specific Storage Profile, from the desired Organization vDC and import the media again. This should send the imported files to the correct ORG vDC. You will need to import Media files multiple times to accomplish this. This only possible if you have multiple storage profiles which I currently do not have. 3. Create a “slave” catalog in the ORG on the Storage Profile vDC B, and have this catalog sync from the catalog created in step 1. 4. Repeat this to have Catalog C on Storage Profile C, and sync to Catalog A. 5. Whenever you add a new ISO image to the Master Catalog, it will automatically update the others in 24 hours or when a sync is requested. ← Pretty Exciting news: VMware acquires AirWatch! Any progress? I've just run into the same thing. Yes, so to resolve this we upgraded to vCloud 5.5.2.2000523. To make this work we had to create a catalog for each VDC inside the Organization. After creating the catalog right click and select properties. Now select the storage policy and also you have the selection for Organization VDC. Whichever ORG VDC is selected with the storage policy, all vapps, media files will placed in this VDC.